The village recreation ground was given by the Bedford Estate to Eversholt Parish Council in 1902. 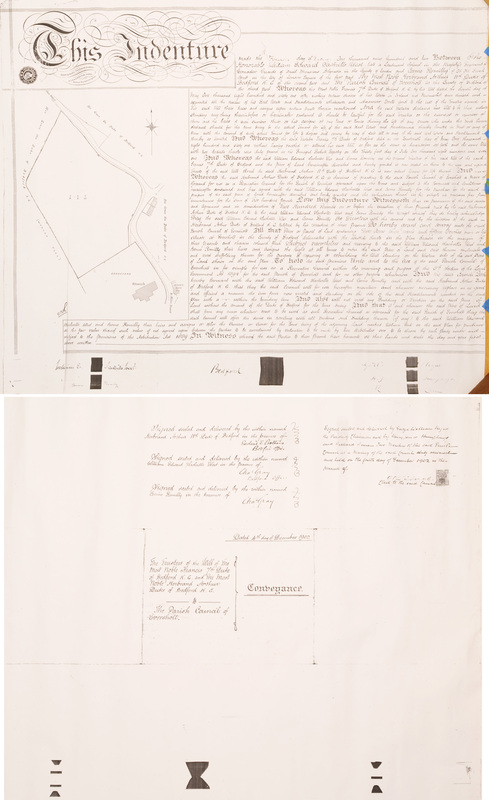 As is common with Bedford Estate properties, there were legal entanglements to do with old wills, and further legal entanglements added limiting what the parish could do with the land. If the land stops being used as a recreation ground, it must be offered back to the estate at an arbitrated price. Any lawyers out there know whether these conditions are still enforceable? Please leave a comment below! Anyway, Anna Blomfield provided a copy of the indenture transferring the land to the parish. Thank You, Anna. Quite where Anna’s copy came from is a mystery, but here it is. Click for a bigger version. There’s a transcript below. 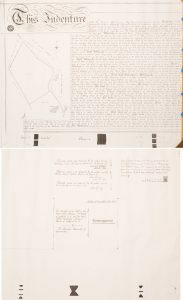 In the transcript that follows, the letters are exactly as the original is written, but the case, upper or lower, has been transformed to a modern usage. Full stops have been added, but not commas, and paragraph breaks added. This indenture made the fourth day of December one thousand nine hundred and two between the honourable William Edward Sackville West late a lieutenant colonel in his majesty’s regiment of Grenadier Guards of Basil Mansions Belgravia in the county of London and Cosmo Romilly of 25 Old Broad Street in the city of London esquire of the first part the most noble Herbrand Arthur 11th Duke of Bedford KG of the second part and the Parish Council of Eversholt in the county of Bedford of the third part. Whereas the most noble Francis 7th Duke of Bedford KG by his will dated the seventh day of May one thousand eight hundred and sixty one after making certainly devises of his estates in Ireland and Newmarket gave devised and appointed all the residue of his real estate and hereditaments whatsoever and wheresoever unto and to the use of the trustees named in his said will their heirs and assigns upon certain trusts therein mentioned. And the said testator declared his will to be that notwithstanding anything thereinbefore or thereinafter contained it should be lawful for the said trustees or the survivors or survivor of them and the heirs of such survivor their or his assigns at any time or times during the life of any person who under the trusts herein declared should for the time being be the actual tenant for life of the said real estate and hereditaments thereby limited in trust or any of them with the consent of such actual tenant for life to dispose and convey by way of sale all or any of the said real estates and hereditaments thereby so limited. And whereas the said testator Francis 7th Duke of Bedford died on the fourteenth day of May one thousand eight hundred and sixty one without having revoked or altered his said will so far as the same is hearinbefore set forth and the same will with two codicils thereto was duly proved in the principal probate registry on the thirty first day of July one thousand eight hundred and sixty one. And whereas the said William Edward Sackville West and Cosmo Romilly are the present trustees of the said will of the said Francis 7th Duke of Bedford and the piece of land hereinafter described and hereby granted is now vested in them to the uses and upon the trusts of the said will and the said Herbrand Arthur 11th Duke of Bedford KG is now actual tenant for life thereof. And whereas the said Herbrand Arthur Duke of Bedford KG is desirous of granting to the said Parish Council of Eversholt a piece of ground for use as a recreation ground for the Parish of Eversholt aforesaid upon the terms and subject to the covenants and conditions hereinafter contained and has agreed with the said William Edward Sackville West and Cosmo Romilly for the purchase for this said purpose of the said piece of land hereinafter described and hereby granted and the inheritance thereof in fee simple in possession free from incumbrances for the sum of two hundred pounds. and the said Council doth hereby covenant with the said William Edward Sackville West and Cosmo Romilly and with the said Herbrand Arthur Duke of Bedford KG that they the said Council will for ever hereafter maintain and whenever necessary replace in as good and efficient a manner the iron fence now erected and standing on the side of the said hereditaments marked on the said plan with a T within the boundary line. From the above, it appears that the 11th Duke didn’t actually own the Woburn Estate. The trustees of the 7th Duke’s will actually control the land. The 11th Duke had to pay the trustees £200 for the land in order to be able to give it away! Presumably the 11th Duke’s money went to the trustee account of which the 11th Duke was a beneficiary, so this is all a piece of tax-efficient nonsense. Anyway, the Duke then gave the land to the parish council, for no fee, which was very nice.